Cursed by a witch to be a vampire, Barnabus Collins wakes after being trapped for 200 years to find a world he is not use to and a family who have given up on the family business that he helped create. They need some help and he is there to provide it for them. Depp, as he does in most Burton films, plays the main character, a vampire called Barnabus Collins who is still aching for his one true love 200 years after losing her to a spell from a witch. Not only has this happened but he needs to bring back the wealth and success of his family to the town of Collinsport away from the evil witch that put the curse on him in the first place. This leads to a few laughs and some lacklustre set pieces that fail to blow you away even with the big name cast that’s present on screen. 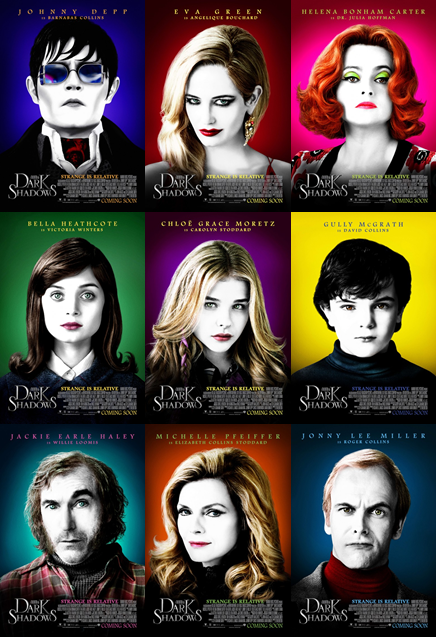 Whether you are aware of Tim Burton or not you would easily recognise one of his films. You get lots of blacks, whites and greys that are offset with bright colours to bring some life to an otherwise dull looking scene. The quirkiness of his characters is less obvious here and even Depp’s vampire seems to be quite underperformed considering his usual acting styles. Helena Bonham Carter is the only real quirky character that comes through but only in blips. The film as a whole was ok and it gives you your typical dark Tim Burton film. However the film lacked that oomph that made me think “that was fantastic”. A good fun monster movie by Burton that unfortunately lacked the monsters. The best thing about Burtons version of a vampire was the classic burning in sunlight and no reflection, how a vampire should be perceived. I would say yes you should see this film but don’t expect to come away thinking wow. A bullied young boy called Oskar get a new neighbour and a friend in a 12 year old girl, or so he thinks as she turns out to be a vampire. The film shows the starting blocks of a relationship between Oskar and his new neighbour Eli. He only ever meets her at night and as his only friend and the only person that has ever taken any interest in him he finally has something in his life that he looks forward too. His parents, who are separated, don’t seem to show much interest in him although his dad tries. What really makes this film stand out is the fantastic cinematography. The camera shots are beautifully filmed and really show of the snowy scenery along with the accompanying light music. There are a lot of scenes where shots are filmed through things; through the trees, through doorways, up stairwells which adds to the great cinematography. The final scene in the swimming baths was truly wonderful and really made this film into what it is. Don’t look at this film and think you know what it is about. Yes it is a foreign film with subtitles and yes the film is about a vampire but it is a heart-warming fantasy/drama film between two characters, who really need each other but for possible differing reasons. There is a bit of blood and gore but it doesn’t detract from what is a beautiful film. I recommend seeing this film. Almost every scene in the movie contains the colour red or red/orange, a clear reference to the colour of blood, the only food Eli can consume. 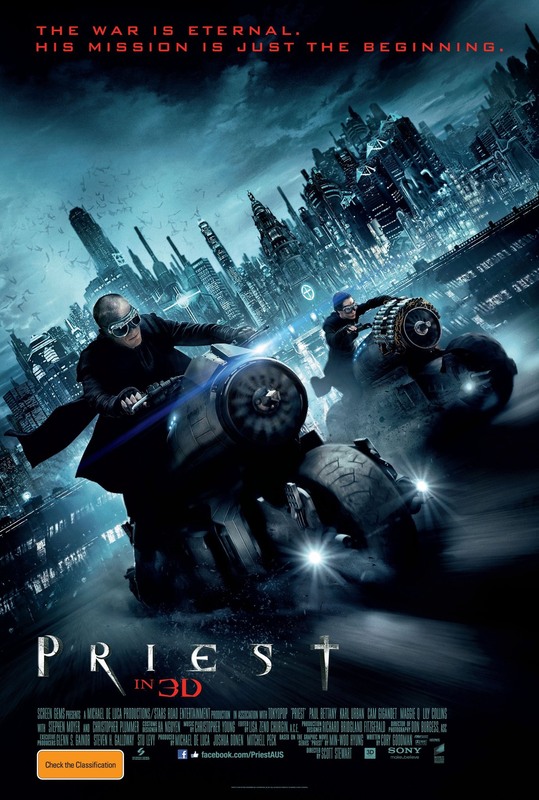 In a post-apocalyptic world where the church is the sanctuary of man a Priest, played by Paul Bettany, goes against what he is told and goes on a quest to save his kidnapped niece from vampires. 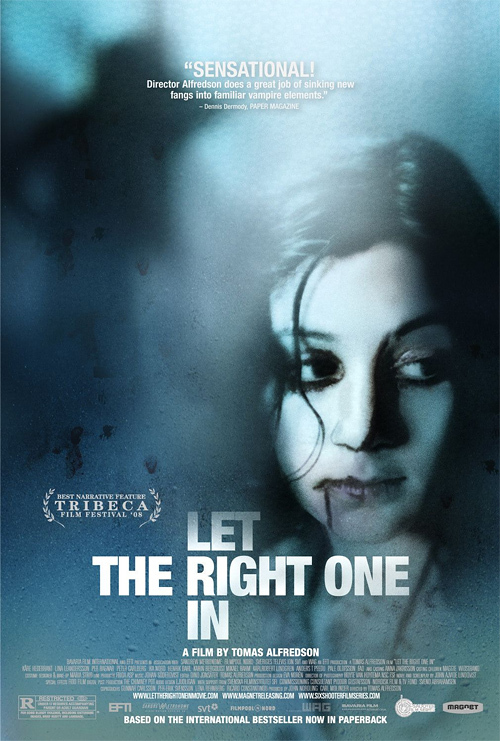 The film run quite smoothly and has a clear narrative while at the same time looking great. The fight scenes have a matrix feel to them with the slowed down effects and having watched this not in 3D you can see where the 3d scenes would be. The vampires in the film are not the vampires everyone is used to these days as they are not in a human form but more in the form of a licker from the Resident evil game series, but instead of a tongue they have vampire teeth. The film was enjoyable for a popcorn flick and the opening credits that show the story of the Priests in a war with the vampires in a graphic novel style is really good. If you would like a no-nonsense sci-fi action film then give this a go. Stephen Moyer, who plays Vampire Bill Compton in True Blood, is killed at the start of this film by a vampire hoard.